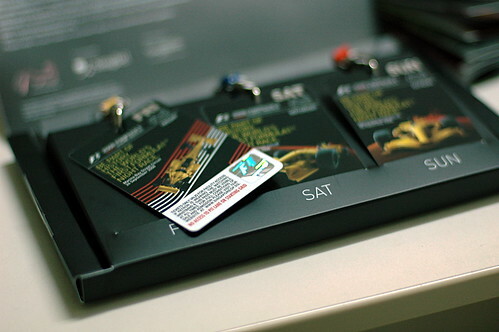 2008 Singtel Singapore Grand Prix Tickets! Walkabout Tickets, originally uploaded by fox2mike. I can hardly wait :) 24 days to go for FP1 and that'll kick off the world's first night race. I got these 3 day walkabout tickets back in June, and took the pics back then too, just been lazy to upload them. The icing on the cake for you would be to take a snap of MS, if he is visiting the race;) Njoy and have fun. > Of course, these are commemorative tickets, and hence plastic. And hence there won't be a dumbass at the entrance who will put a tear in it. Electronic punching I guess like in the metro. And usually, the tickets have perforations (Sepang 2007 did) and they cleanly tore only that portion away :D And didn't split my ticket into some odd fraction! The Australian Open had this really nice, scan it yourself system and they used barcodes as well.